For the last week I've had THE FLU. I've basically slept 5 out of the last 7 days. Its amazing how much getting the flu can take out of you. In between sleeping I did tat a bit (the first 2 days I was too sick to do anything but lay there). I'm making snowflake bookmarks for a friend. She's giving the bookmarks with a Chapters gift certificate to her son's teachers for Christmas. I have no pictures yet. As I have been feeling better I've started decorating my house for Christmas. After Halloween I bought a black mina ture Christmas tree on sale which I've put in my kitchen. I was trying to figure out how to decorate it when I realised that I had a bunch of small motifs from Karey's book Tatting for the tree. The ones on the upper right were the perfect size for the tree. I used the snowflake on the left as the tree topper. Looking through my pictures just now I saw this white 1/2 ring braid. 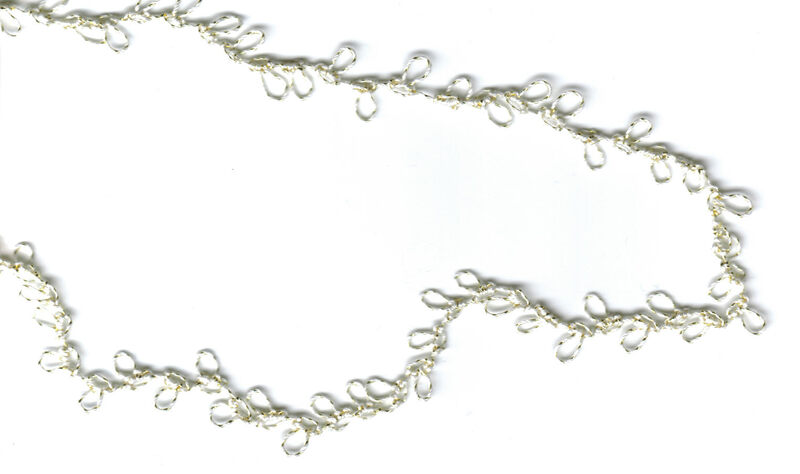 I think it will be really nice as a garland on the tree. I just need to find it. I am sorry to hear that you've had the flu. Hope you are on the mend. I've been tatting quick little snowflakes. Kind of rewarding to get immediate satisfaction (unlike big projects where I slog along). Re that edging I tatted! You are absolutely right, it does look like hearts when it's upside down. Serendipity at work, since it is for a wedding. How keen of you to notice. Oh, so sorry you've got that bug! I slept for 3 days when I had it. It really takes your legs out from under you. I hope you'll post a pic of your little tree all decorated, because those ornies are so pretty, & the topper is awesone! Oh so very nice idea. Hope you feel better each new day. Happy Tatting! Nasty flu! I know! Hope you are over it now, but take it easy! Oh, that flu is a bugger! It kept me out of work a whole week last week! It does exhaust a person, doesn't it? 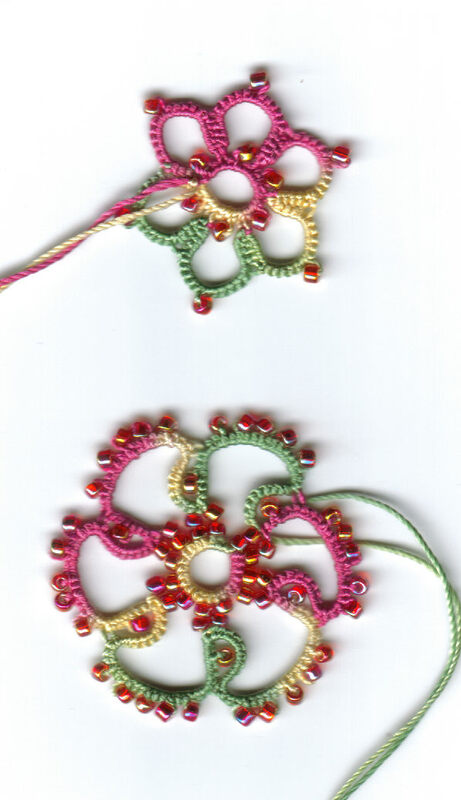 Your tatting projects are very nice! At least you all have that flu over and done with. 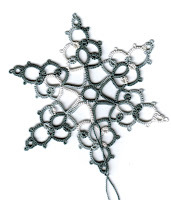 Great tatting, what pattern is your tree topper, not sure if I recognise it or not. Love the braid idea. Thanks for all your comments. I can't believe how much the flu takes out of a person. The tree topper is from Karey Solomon's book Tatting for the tree. The picture in the book doesn't do it justice.